DAVE BRUBECK "In the early fifties I worked with Bud Powell at Birdland in New York City. We did not communicate verbally very much, but we listened intently to each other. . . . Bud knew how to reach the inspirational part of his mind and when he was at his peak, his performances were absolute perfection in every respect. 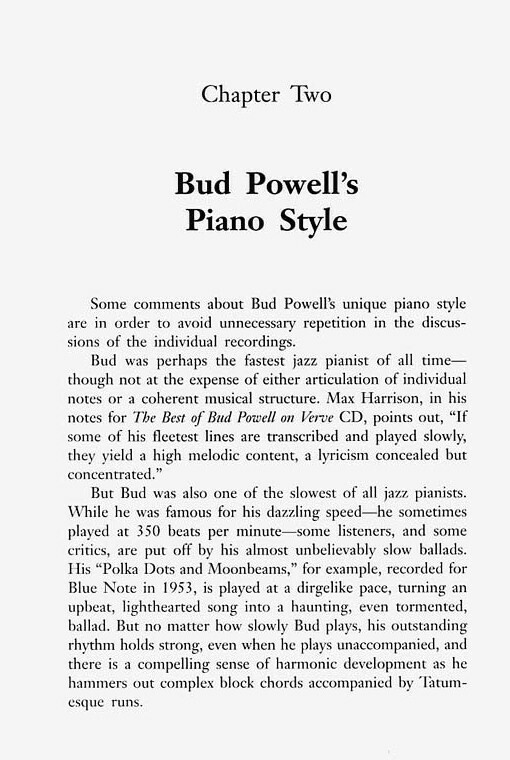 If this book helps to explain Bud Powell and his influence on generations of pianists who followed him, it will have done a great service toward the understanding of jazz and the illumination of an enigma, Bud Powell, a legendary figure in jazz history." CLARK TERRY "Bud Powell was an iconoclast, as unique in his own way as Thelonious Monk. 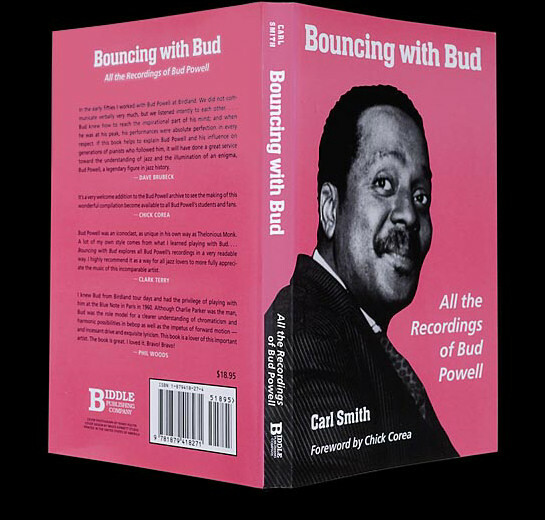 A lot of my own style comes from what I learned playing with Bud. . . . "Bouncing with Bud" explores all Bud Powell's recordings in a very readable way. I highly recommend it as a way for all jazz lovers to more fully appreciate the music of this incomparable artist." PHIL WOODS "I knew Bud from Birdland tour days and had the privilege of playing with him at the Blue Note in Paris in 1960. Although Charlie Parker was the man, Bud was the role model for a clearer understanding of chromaticism and harmonic possibilities in bebop as well as the impetus of forward motion - and incessant drive and exquisite lyricism. This book is a lover of this important artist. The book is great. I loved it. Bravo! Bravo! " Carl Smith has been an avid jazz fan since the 1940s when, as a child, he heard on the radio the big bands that were popular at that time. His father brought home a copy of Benny Goodman's 1938 Carnegie Hall Jazz Concert recording, released in the late forties, and he played it until he knew every note. 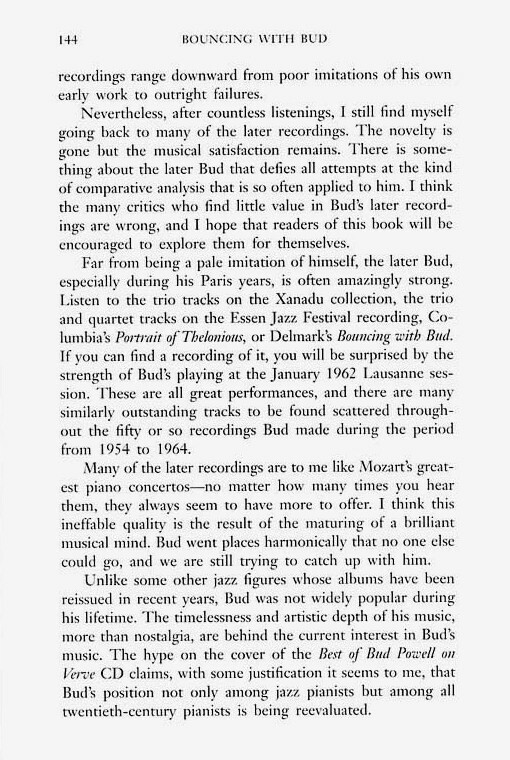 He bought his first Bud Powell record in the fifties, which he still has in his collection, and through the years has developed a deep interest in all periods of jazz, from its emergence as a popular art form in the twenties to the avant garde. 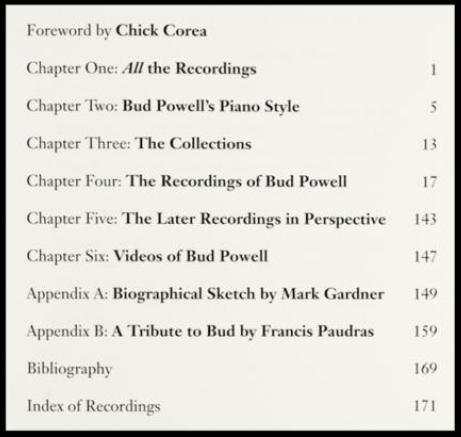 In addition to having every Bud Powell track ever released, including extremely rare and out-of-print items, Carl also has copies of every unreleased and private recording of Bud Powell that can be obtained, including considerable video material. Carl has also become widely recognized for his extensive collection of privately made live recordings of the great Sonny Rollins, who played with Bud Powell on the classic Blue Note recordings of 1949 and remarkably is still playing brilliantly today. Sonny Rollins' 2005 CD "Without a Song, The 9-11 Concert" is based on a tape Carl made from the audience, which resulted in a Grammy for "Best Jazz Solo" for Sonny. He collaborated with Sonny on the 2008 CD release of Sonny Rollins: Road Shows Vol. I, which includes several selections from Smith's collection of Sonny's privately recorded live performances. 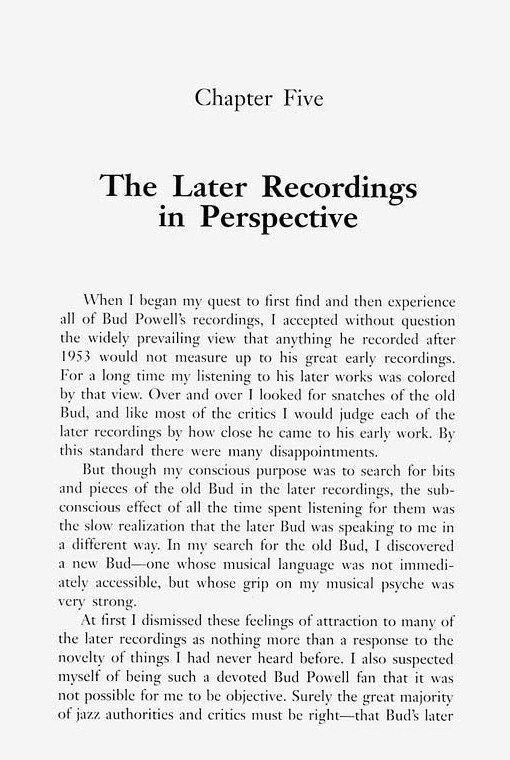 Articles about Carl's work with Sonny Rollins' live recordings have appeared in The New Yorker ("The Colossus", May 9, 2005), The Boston Globe ("Wired", August 28, 2005) and in all the major jazz magazines (for example, "The New Benedettis", Jazz Times, August 2004). 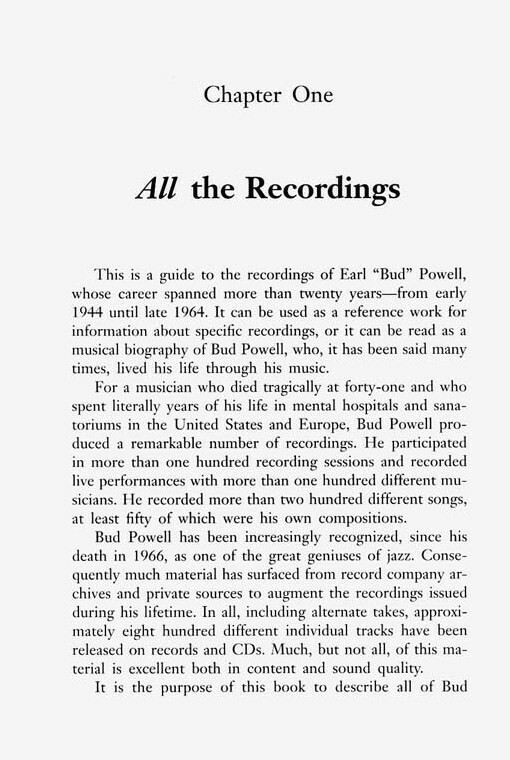 Bouncing with Bud: All the Recordings of Bud Powell can be purchased online or by phone or mail from The Jazz Record Center in New York City. 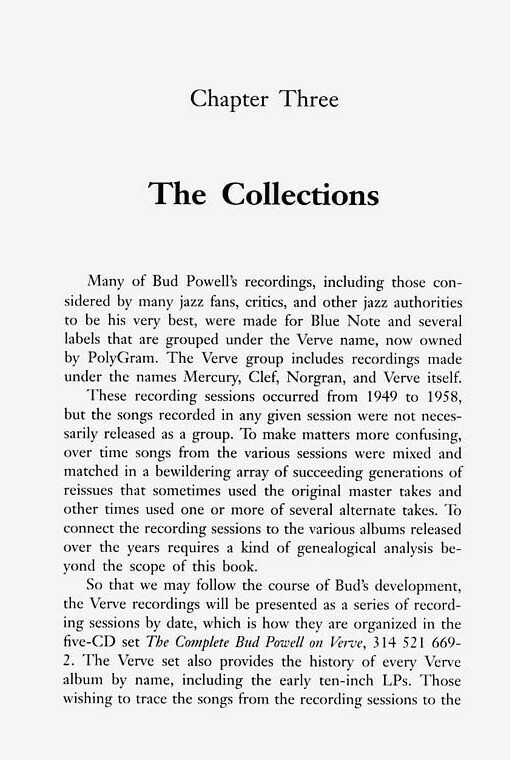 Covers every recording ever made by Bud Powell, over 800 tracks in all, as well as information on videos, a bibliography, a biographical sketch, and 75 pictures. High-quality paperback, 175 pages, 6 x 9 inches.